When I was a child, I started collecting postage stamps. My dad and mom found an old box of stamps in my great grandmother’s attic, and I inherited them. Some friends of ours had a postage stamp collection, and they loved collecting Disney stamps. The Disney stamps were small splashes of color with familiar characters on them, and their bold designs really stood out from the older, less colorful stamps I had in a box in my bedroom. Visiting the Miniature Fine Art Show at Artistic Designs Gallery returned me to those days. The exhibit displays works of fine art that are bigger than a postage stamp in most cases but smaller than a post card. To be legitimately considered miniature fine art, these works of art must be no more than 1/6th the size of the object in real life and they must display a mastery of their craft. Coming from a background that lacks any artistic nature, I was so pleased that gallery owner Laura Tesdahl was willing to share her expertise with me. Her knowledge and love of art is apparent in her conversation and sharing. The Miniature Fine Art Show is in it’s 9th year at the Artistic Designs Gallery, and it gets better and better each year. Submissions come from different artists all over the country and then are scrutinized before being accepted into the show. Some artists who are top in the miniature fine art arena have works displayed, and others who are considered hobbyists also have submissions, but each artist has mastery of some sort. Every piece is for sale and some are already sold. Magnifying glasses are available for use so you can get a closer look at the detail within each piece. These small canvases have so much life within them that you can see the candles flicker, feel the coolness of the water as the dog shakes from the lake and hear the seagulls as they fly overhead. Art enthusiasts, people with a novice interest in art and those with a deep appreciation for art will all enjoy and learn from this exhibition. If you have a question, ask. Your eyes will be opened up and your mind will see so much more than you could have imagined a teeny canvas could capture. 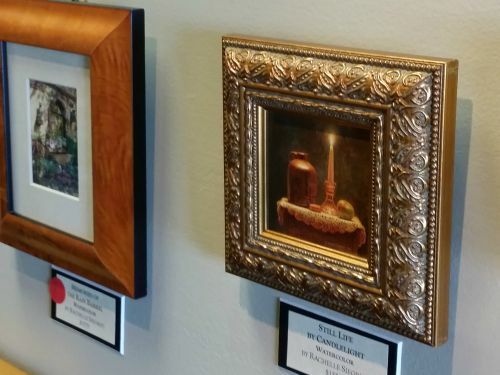 The Miniature Fine Art Show is free and open to the public through Aug. 22. Visit Artistic Designs Gallery, 1038 E. Main St., Brownsburg, Tuesday and Thursday, 10 a.m.-7 p.m., Wednesday and Friday, 10 a.m.-5 p.m. and Saturday 10 a.m.-4 p.m.. Other times and dates available by appointment, call (317) 852-0252.